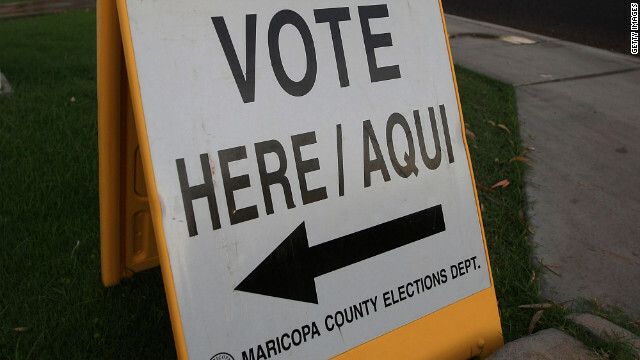 A bilingual sign announcing a polling place in Phoenix in 2008. Latino voters are the fastest growing electorate in the country. Editor's note: Ali Noorani is executive director of the National Immigration Forum Action Fund, an organization based in Washington that advocates for the value of immigrants and immigration to the nation. Follow him on Twitter: @anoorani. (CNN)- A month after defending the health care law, the Obama administration again confronted the buzz saw of skeptical Supreme Court justices on Wednesday - this time on immigration. But come November, Republicans may very well be on the losing end of the argument. As has been widely reported, oral arguments regarding Arizona's SB 1070 illegal immigration law began with an unusual interruption: Chief Justice John Roberts broke in during U.S. Solicitor General Donald Verrilli's opening comments to ask assertively, "No part of your argument has to do with racial or ethnic profiling, does it?" And, while it is difficult to predict how the justices will rule, Justice Sonia Sotomayor signaled the tough road ahead when she said of the administration's argument, "You can see it's not selling very well." What does this mean? Because we can’t see us on the Internet are we allowed to get insntliug ? Personally I would have thought Why is it so complicated to imagine that blog writers publish to a global audience, a decade after the start of the Internet? was a rather insntliug thing to say . You HAVE to be an american citizen to vote. I dont care what your heritage is, go to the DMV with 25$ and buy a nondriverID. Whats so hard about this?